If your hobbies include Microsoft-bashing, then read on. The company has announced that their new Office Web Applications will officially support IE7, IE8, and Firefox 3.5 on Windows and Safari 4 on Mac. There is no mention of Google Chrome or Opera so, understandably, many fans of those browsers are working themselves into a paranoid anti-trust frenzy. The Office Web Apps blog states that other browsers may work and users should try them. Browsers won’t be blocked and Microsoft’s goal is to ensure broad compatibility and reach. This begs the question: why should you, Microsoft, or any other company commit to “official” supported browser lists? As I discussed in my previous article, web sites and applications should be written for the web — not browsers. We should strive for systems that are device-independent rather than targeting specific OS and browser combinations. 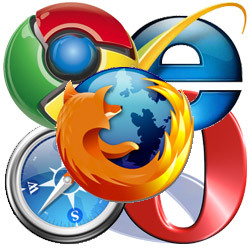 Microsoft has not tested several popular browsers during development. Patching a product after release is far more difficult and time-consuming than comprehensive testing during the main development phase. Will Office work in later versions of IE, Firefox or Safari? The web application is not due until 2010 — Firefox 4 and Safari 5 could certainly be available. The Office web applications have not been released and will probably enter a beta phase. Opera and Chrome users account for a small percentage of the market. Only a proportion of those users would try the applications. Few of them should encounter compatibility bugs. Only a small percentage would report issues to Microsoft. Microsoft might receive a handful of support requests, but that information could be invaluable when they attempt to fix compatibility problems. Componentize your code and unit-test in a variety of browsers. Do not strive for unrealistic/identical cross-browser functionality. Use progressive enhancement to add features when the browser supports it. Browser support lists are more trouble than they’re worth. See also: 5 Reasons Why You Should Not Publish Supported Browser Lists.